HomeFans of Peter S. Beagle: cheated by Conlan Press and The Last Unicorn movie tour. “There are countless consumers who have never been given the items they ordered. This is not an occasional failure on their part, but a way of business. They are fleecing fans, and that’s shameful”. Dear robbed customers of Conlan Press: WE NEED HELP! Connor Cochran is the operater/owner of Conlan Press and manager of The Last Unicorn movie tour. He has taken our money for many years without producing goods. When we complain, we get no goods or refunds. There have only been excuses that keep changing – a string of broken promises. See a list of victims. If victims buzz too loudly, Cochran blasts them for causing problems… as if these complaints aren’t harm he did to many independent sources. Please share them and demand help NOW. Goods are undelivered since 2004, while Connor Cochran is robbing us to make himself RICH. In 2009, Cochran moved into a million-dollar home. In 2011, he boasted about business expansion to Publisher’s Weekly. In 2013, he took control of the millions-valued Last Unicorn movie for an international tour. He boasted of a plan to spend “five million dollars” and attracting 15 million in investment. BUT STILL NO GOODS! Connor Cochran is a predator hiding behind Peter S. Beagle. Cochran is exploiting fan love for a poor, innocent writer. Peter Beagle appears unaware of the scams done in his name, because he only wants to write, and avoids business. Since the 1970’s, Beagle was exploited by businessmen who didn’t pay him. In the 2000’s, Cochran fought them to take control of Beagle’s rights. After getting them, Cochran switched exploitation from Beagle… to his fans. Remember: Peter Beagle DOES NOT OWN Conlan Press. Cochran does. He constantly acts as if Beagle is in poverty, and begs us to support him. (Actually – to buy goods that support Cochran’s own expanding properties.) He excuses non-delivery by blaming the death of Beagle’s mother… all the way back in 2006. The excuses always play on our heartstrings, while Cochran says they come from Beagle… but Beagle tells fans seeking undelivered goods that he’s “not really connected to” the publishing house. Cochran on left – placing himself on Beagle’s level in his messages to the fan email list. It gets worse: Cochran’s partner is disgraced ex-lawyer Charles Petit, who scammed $10,000 from the estate of John Steinbeck. Cochran is aided by disgraced former lawyer, Charles E. Petit. Petit lost his license for ripping off $10,000 from the estate of John Steinbeck. An unlicensed lawyer is not allowed to give legal services. Petit is Charlie@conlanpress.com , and cepetit@scrivenerserror.com. He’s named here as attorney for Peter Beagle. This site holds official Conlan Press legal documents signed by Petit. 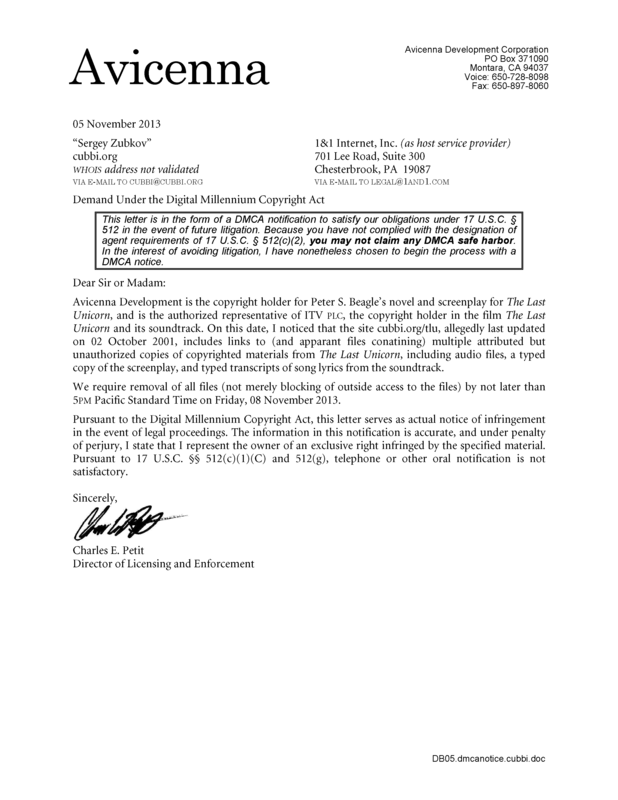 In 2013, 6 years after his license was lost, Petit forced a Last Unicorn fan site to remove contents “after 17 years on the web” with a DMCA Takedown Request that he issued on behalf of Cochran’s Avicenna Development corporation. Avicenna Development is suspended but still used for business. Conlan Press is active with the CA Secretary of State. This site holds private email documents where Cochran blames multiple workers for mismanaging his business. It’s a convenient excuse to hide his own abuse of workers and buyers. He even sent email posing as former employees. The common denominator in the excuses is Connor Cochran. Is Cochran in the business of taking estates from elderly authors? “GOOD NEWS DELAYED PRODUCTS UPDATE: Nearly all of them will be done and shipped by the end of the year. Those that aren’t will be at the printing plant and on their way for shipping in early 2012.” – They’re still not delivered in 2014. Conlan Press maintains a web listing of sold but undelivered items. Delivery dates have changed over many years, with new excuses each time it’s updated. Cochran promises angry customers that they will always be informed about their missing goods there… but in 2014, it only has a failed promise of 2013 delivery for products sold as long as 10 years ago. Complaints are still being referred to a long-expired excuse. In late 2014, the Conlan Press “News” page. Since 2004, “unexpected turns of events”. Excusing fraud from 2004 to 2014. Demand solutions NOW from Connor Cochran. BEWARE of Conlan Press. Please spread this report among fans, to protect each other – and writers! After years of broken promises, it’s time for pressure to demand accountability – and refunds to every deceived customer. Hi, I came to see the show when you came in Montreal, Quebec in may last summer and I bought one of the prints after the show. A while after I read that you were having trouble with shipping and customs and that the merchandise would be delayed. I was wondering how is the situation with all that and if I can expect to receive the print soon.